This week in class we covered the Holocaust. I always tell the students that I love that we cover this important topic, but at the same time, I also dread it because the topic is difficult for me. The whole thing was such an affront to humanity that revisiting it every semester is difficult. Yet so, so important. In this class we take perhaps an atypical approach–we learn the history, but we also explore the event through different art mediums. The chapter the students read is from a text we have written at the university. There are three main contributors, myself included, and a few others that advised and helped in other chapters. It has been such a pleasure to write a text jointly from our own angle specific to the goal of our class–which is basically looking at events, trends, and themes of the 20th Century and how humanity has grappled with those through art and propaganda. Our Holocaust chapter covers not just historical events in a very frank way, but also has a section on how Hitler confiscated all kinds of art–Jewish, modern, whatever he didn’t personally like–and burned massive amounts of it, sold it off, or used it to mock artists and art lovers everywhere is his degenerate art show. If he liked a piece he was going to use it to populate his own museum and basically adopt it into his “Aryan” aesthetic. Apparently, exterminating millions of people was not enough for him. He had visions of ripping away entire cultures, family stories, and personal and collective heritages. The idea of stripping away every last bit of what is beautiful and revered by cultures the world over adds yet another layer of how far he was willing to go to establish his own empire–which he hoped would take over the entirety of the world. In my recent trip to New York, I was able to see some of Hitler’s “approved” art and actual, confiscated pieces that hung in the “degenerate” art show at Die Neue Galerie. Hitler’s approved works were hyper realistic, propagandistic, and in some instances (and in my opinion), pretty crass and pornographic as well. Most of his approved art was banal, uncreative, and cliche. On the other side of the gallery stood pieces that dealt with real issues, were often difficult, but said important things. They also had such great creative differences in the use of color, composition, and subject matter. Can you even imagine if we had one ruler who dictated what kind of art is “Acceptable”? One style, one approved methodology, one way of looking at the world? The stamping out of individual creativity is truly subversive, and akin to what also happened during the 30s and 40s (and even later) in the USSR, as a way to control the people and take over all creative effort and make them subservient to the oppressive governments. It gives me the willies just thinking about it! We spend some time looking at “approved” art vs. the so-called “degenerate” art. We also take a critical look at the massive propaganda campaigns waged against the Jewish people, and ask ourselves how this could have happened. In preparation for class, the students also read a very moving Holocaust short story called The Shawl by Cynthia Ozick, which is beautiful, but stark and brutal too. They read a speech by Elie Wiesel called The Perils of Indifference, in which he pleads with humanity at large. He asks: do you personally do anything in your life to relieve the suffering of others? Or are you indifferent? We look at the quilts made by Holocaust survivor Esther Nisenthal Krinitz, and listen to music by Swedish-Jewish composer Bloch as well as music from John Williams’ soundtrack to Schindler’s List. 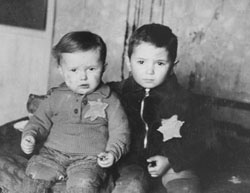 I think approaching the Holocaust through the hearts of others is an exceedingly effective way to teach this subject. I am by no means an expert, and my teaching has many failings, but in this instance the wonderful artists, musicians, and writers can do the teaching for me through their art, music, and powerful words. This last week I was a little sleep deprived. It’s summer–in all reality I want to read a few fluff books and go hiking. It is difficult to be in the middle of a semester. This semester I approached my class with not a bit of trepidation; more than anything, I wanted to conduct a discussion worthy of the subject matter, but was not feeling up to the task. I am not usually nervous for class, but I was that day. I asked a young man to open class with prayer. As I teach at a religious university, it is our privilege to seek divine inspiration in our day to day instruction. This young man stood and offered a most beautiful prayer. He prayed that our discussion of the day would be worthy of the topic. He asked that as a class we could understand the seriousness of the Holocaust, and feel empathy for those who sacrificed so much. He asked that we all might know how to apply the lessons we can learn from history and the humanities to our own lives–that we might know how to make a difference in the world. The prayer invited such reverence and humility into our discussion that I was overwhelmed with gratitude. I was so grateful for the words of Elie Wiesel, and Cindy Ozick, and the art and music that had touched the students and prepared them to discuss this topic. And I was so grateful to this student, and the other students that day, who offered so much of themselves so that I could be a student with them that day as we attempted to cover this insurmountable topic. Fellow teachers and fellow students: what materials have most made a difference to you in understanding the Holocaust? The holocaust materials that had the greatest impact on my life were the writings and life stories of Primo Levi and Corrie Ten Boom, but I have to admit–it all started with those gradeschool readings of Anne Frank! So I hope Frank’s diary will remain a staple in the curricula of younger grades, because she sparked my first interest in learning more about/honoring the lives of holocaust victims! In love the Diary of Anne Frank too, and The Hiding Place. I am not familiar with the other author–I will have to look into that! Primo Levi was an Auscwitz survivor whose memoirs of the Holocaust are chilling but literary masterpieces at the same time! Alas, after all he did to survive that ordeal, he ended up dying tragically in what some think was a suicide–me, I’m not quite convinced yet. He could have been pushed! I will definitely have to look into that! Wow. Very good. I might have to use this for class! Thanks for the tip! I think I am going to have get these books and add them to my summer reading list.